The urinary system maintains blood homeostasis by filtering out excess fluid and other substances from the bloodstream and secreting waste. The renal system eliminate wastes from the body, controls levels of electrolytes and metabolites, controls the osmoregulation of blood volume and pressure, and regulates blood pH. The renal system organs include the kidneys, ureter, bladder, and urethra. Nephrons are the main functional component of the kidneys. The respiratory and cardiovascular systems have certain functions that overlap with renal system functions. Metabolic wastes and excess ions are filtered out of the blood, combined with water, and leave the body in the form of urine. A complex network of hormones controls the renal system to maintain homeostasis. ureter: These are two long, narrow ducts that carry urine from the kidneys to the urinary bladder. osmoregulation: The most important function of the renal system, in which blood volume, blood pressure, and blood osmolarity (ion concentration) is maintained in homeostasis. The renal system, which is also called the urinary system, is a group of organs in the body that filters out excess fluid and other substances from the bloodstream. The purpose of the renal system is to eliminate wastes from the body, regulate blood volume and pressure, control levels of electrolytes and metabolites, and regulate blood pH. 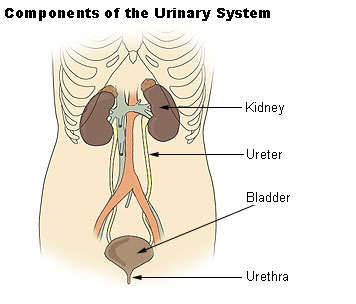 The renal system organs include the kidneys, ureters, bladder, and urethra. Metabolic wastes and excess ions are filtered out of the blood, along with water, and leave the body in the form of urine. Components of the renal system: Here are the major organs of the renal system. The renal system has many functions. Many of these functions are interrelated with the physiological mechanisms in the cardiovascular and respiratory systems. Removal of metabolic waste products from the body (mainly urea and uric acid). Regulation of electrolyte balance (e.g., sodium, potassium, and calcium). Osmoregulation controls the blood volume and body water contents. Blood pressure homeostasis: The renal system alters water retention and thirst to slowly change blood volume and keep blood pressure in a normal range. Regulation of acid-base homeostasis and blood pH, a function shared with the respiratory system. Many of these functions are related to one another as well. For example, water follows ions via an osmotic gradient, so mechanisms that alter sodium levels or sodium retention in the renal system will alter water retention levels as well. Kidneys are the most complex and critical part of the urinary system. The primary function of the kidneys is to maintain a stable internal environment (homeostasis) for optimal cell and tissue metabolism. The kidneys have an extensive blood supply from the renal arteries that leave the kidneys via the renal vein. Nephrons are the main functional component inside the parenchyma of the kidneys, which filter blood to remove urea, a waste product formed by the oxidation of proteins, as well as ions like potassium and sodium. The nephrons are made up of a capsule capillaries (the glomerulus) and a small renal tube. The renal tube of the nephron consists of a network of tubules and loops that are selectively permeable to water and ions. Many hormones involved in homeostasis will alter the permeability of these tubules to change the amount of water that is retained by the body. Urine passes from the renal tube through tubes called ureters and into the bladder. The bladder is flexible and is used as storage until the urine is allowed to pass through the urethra and out of the body. The female and male renal system are very similar, differing only in the length of the urethra. The kidneys play a very large role in human osmoregulation by regulating the amount of water reabsorbed from the glomerular filtrate in kidney tubules, which is controlled by hormones such as antidiuretic hormone (ADH), renin, aldosterone, and angiotensin I and II. A basic example is that a decrease in water concentration of blood is detected by osmoreceptors in the hypothalamus, which stimulates ADH release from the pituitary gland to increase the permeability of the wall of the collecting ducts and tubules in the nephrons. Therefore, a large proportion of water is reabsorbed from fluid to prevent a fair proportion of water from being excreted. The extent of blood volume and blood pressure regulation facilitated by the kidneys is a complex process. Besides ADH secretion, the renin-angiotensin feedback system is critically important to maintain blood volume and blood pressure homeostasis.